Later that week I contacted the rector of St Conan’s, Washaway to see if I could gain entry there as I know that church is normally kept locked. I was really pleased when he got back to me saying that the church has a key safe to which he gave me the combination. Wouldn’t it be wonderful if more churches that feel the need to stay locked took up this idea. 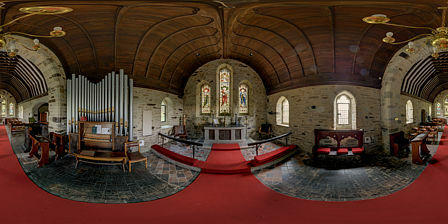 St Conan’s is a very small chapel attached to the parish of Wadebridge – the two main churches are Egloshayle and St Breock. 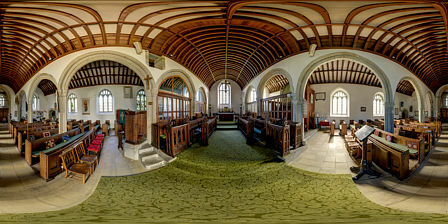 It was built in 1883 but it contains a Saxon font, one of the oldest in the country. It also has a 16th century carved wooden pulpit brought from Germany from which Martin Luther is thought to have preached. 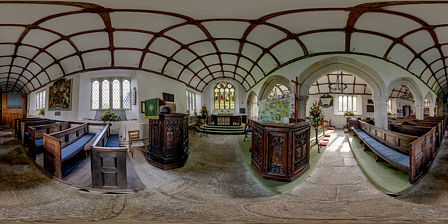 The following week I photographed the churches at Lostwithiel, Tywardreath and Golant. At Golant there are some nice 16th century bench ends that have been incorporated into the pulpit, a lectern and a parclose screen. The wagon roofs to both the nave and south aisle also have some very nice carving. There were another three I was going to photograph, but again, they were locked. One had this less than inviting notice on the door. 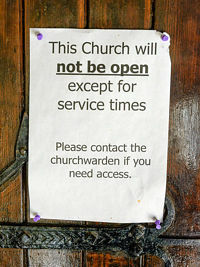 And why say to contact the churchwarden but then not give any contact details? This entry was posted on Friday, October 26th, 2018 at 5:14 pm and is filed under History, Panorama, Photography. You can follow any responses to this entry through the RSS 2.0 feed. Both comments and pings are currently closed.